If I have to alight on one incident of surpassing significance amidst the mayhem of Rob Ford’s mayoralty, I find myself bypassing the chaos of the scrums outside his office, the humiliations of the trials, the self-destructive behaviour, and the endless examples of how this curious man coarsened Toronto’s civic discourse. Rather, I think back to that riveting moment, deep into a long night of deputations about proposed budget cuts in July 2011, when 14-year-old Anika Tabovaradan eloquently articulated her sense of loss and hopelessness in the face of Ford’s gravy-train agenda. Her local library branch, where she went to do the homework that would allow her to get a career and then start paying taxes so that other kids could benefit from such amenities, had been threatened by cuts or closure. “I’m not a director, I’m no president, I’m just a 14-year-old from Scarborough,” she sobbed. The mayor listened, not just impassively but unaware, as indeed were we all, of the immense consequence of what had just transpired. As observers of his career may note, Tabovaradan’s plea, which was amplified in the media and at city council, came to represent a psychological watershed: the point at which Ford’s populist grip on council and the city’s politics began to waiver, wane, and then vanish during the hallucinatory years that followed. Why travel back to this particular episode in the hours after his death? I want to write candidly about him, but not cruelly. It is, as many will say, a terrible personal tragedy that he died so young and in pain, and that he leaves behind a young family. But I don’t want to reach for maudlin obituary prose here. I didn’t respect Ford as a public person (the only way I ever encountered him), and didn’t like what he did to our politics. What’s more, like many reporters on the City Hall beat during those four nutty years, I benefited professionally from that three-ring circus, and the adrenaline-fueled thrill of being in the middle of a story that made it onto the New York Times’ home page more than once. Many people will feel bad about Ford’s premature death, but not sad. Yet we are compelled to seek meaning in this life that has come to a close, and particularly a sense of meaning that extends beyond the universe of his family and friends. It seems to me that Ford’s place in the city’s story is that he, with his brother Doug, caused so many Torontonians to wake up and to see, as Tabovaradan did, precisely what was at stake. In a relatively short period, he tore up transit plans now being dusted off, and slashed bus, recreation, and community services in the very parts of the city he claimed to defend. Ford hypocritically misused the city’s resources with his football coaching, behaved crudely to constituents, bureaucrats, and fellow councillors; showed little regard for the dignity of the office; and embarrassed the city in front of a global audience. Eventually, even early supporters came to see what was being squandered. As Joni Mitchell once sang, You don’t know what you’ve got ‘til it’s gone. Yet despite the best efforts of his advisors, Ford lacked the Machievellian instincts and self-discipline to carry through with his penny-pinching agenda, and cement all that accruing loss into place. For all his bluster and dissembling, he couldn’t, in the end, defend his record or look out for himself; perhaps that weakness explains the self-medicating behaviour that accelerated during his term. So thanks to the insistently dialectical nature of politics, he gave us an incredibly important opportunity to re-discover the qualities that make Toronto a peaceful and aspirationally inclusive city — a place where most people understand that the public sphere is more than a cost centre. It’s certainly not the legacy Ford intended, but it’s a powerful legacy nonetheless. Thank you Spacing and Mr. Lorinc. His unintended legacy taught/reminded us of the same thing that the Harper “legacy” has taught/reminded of us. That is that life itself is more important than just dollars. Well written. Condolences to the family. History will not be kind to Rob Ford. A positive, and intended legacy of Ford’s success was the importance of paying attention to your constituents and personally responding to their concerns. Unlike other, more divisive positions, his mantra of “customer service” was one that resonated with most Torontonians. It influenced at least some other politicians and civil servants to follow a similar principal, even if their broader philosophies policies and goals were very different. Ford also showed the importance of being yourself in public life. People were surprisingly willing to forgive and accept his many faults and missteps. It baffled many (including myself) that hundreds of thousands of Torontonians saw Ford as “honest” even as he repeatedly made statements that were demonstrably untrue. But what they saw was his authenticity. Most politicians – heck, most of us, period – try to create a public face that is broadly popular and comfortable. We know this about our representatives, and so we wonder; what is going on behind that public face? What is that person really like? What do they really think? What are they REALLY trying to do? With Rob Ford, you knew the answers. His words may have often been untrue, but his underlying character, motivations and ideas were an open book. That was the honesty that people saw and appreciated. Amen. Let’s mourn his death as a tragedy for him and his family and friends, but avoid pretending he was something he wasn’t. I could never forgive the flagrant homophobia, the shameless lies and gargantuan hypocrisy. Toronto can now rest in peace. The sadness of a young man with a young family dying in pain is the important thing. He may have served well as a councillor but he was not what Toronto needed as a mayor. Than you for not jumping on the, “He was a great man, a human being with feet of clay just like us” bandwagon…He trashed the dignity of office, Transit City would be up and running this spring. Thank heavens his intemperate polarizing and bullying, (if you don’t agree with me, Ford nation will fall on you to your deep regret ) and destructive civic policy have ended. His associations with the likes of Lisi and David Price..His contempt for enfranchised workers and delight in privatizing civic services, his blatant disrespect for Pride events, all sprinkled with ravings of a madman. A city hi-jacked by suburban, entitled rich kids, with a reputation of drug dealing and partying in and around Etobicoke. The Ford Bros, Authentic bullies and boors thumbing their noses at so called urban elites. Proudly supported by fist pumping, isolated suburban disenfranchised outcasts. A perfect storm that at last has mercifully past. Could THIS be the purpose for the existence of a Donald Trump? That pretty much sums up my feelings. It’s difficult to *not* write something cruel when such a large number of “supporters” (arguable, since many of them were enablers of a troubled man) are spouting literal nonsense on his death, but you’ve obviously taken a deep breath and spoken truthfully. He ultimately was horribly unsuited for the job, which needs bridge builders, not us-vs-them populists. One thing he did for me personally is to force me to take a quantum leap in caring about what’s going on at city hall. He seemed poised to try and tear it down, an anti-government libertarian’s dream. How quickly they forget. In November, 2013, city council voted 39-3 to take away Mayor (at the time) Ford’s ability to appoint and fire the chairs of the city’s standing committees and other powers. They also voted 41-2 to designate those powers to the deputy mayor. Now they are praising him? 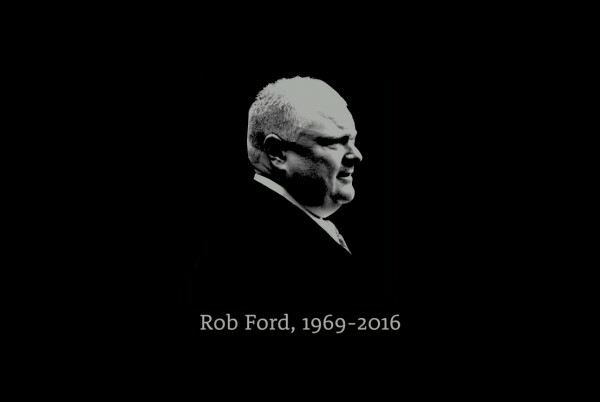 History will be much kinder to the memory of Rob Ford than the author and most of the pundits in here are being. You see, most of us great unwashed see something of ourselves in a shakespearian character like Rob; someone who publicly wore his failings on his sleeve rather than hide them behind the easy platitudinal political correct wailings of armchair liberals. Markus — that’s not what Mr Noble was saying. And to be accurate, Ford never wore any of his failings on his sleeve. He would only ever admit to them when confronted with a mountain of facts (i.e., smoking crack, crack video, driving drunk, pouring beer on Leaf fans, etc….). He actually hid all the time — no press conferences, thumbed nose at press questions, etc. So, yeah, you can believe your revisionist history over a beer with Doug and Sandro Lissi, but not many others will drink that Kool-Aid. Well-said Lula. History will not be kind to Ford. He did nothing of lasting value to help this city. Getting a few potholes filled, and a couple of contracts signed will not be remembered as great feats a generation from now. The global embarrassment, scandal and polarization is what will be written about in decades to come, along with the personal tragedy of dying so young. His memory will be mourned, but not his public legacy. Any word on how Anika Tabovaradan felt after the 2 strikes by librarians closed down ALL Toronto libraries?